A truly one of a kind gift will be cherished for years to come. 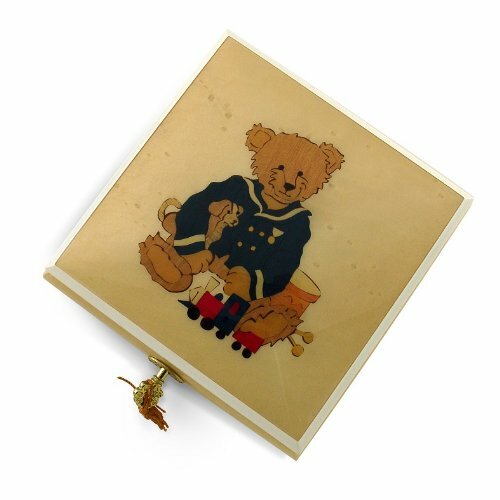 Tailored around our childhood memories, this treasured keepsake features a hand-inlaid Teddy Bear with a traditional navy outfit. He sits patiently amongst other nostalgic toys This gorgeous artwork is all gently framed in an ivory lacquer outline. Completely hand-made in Sorrento, Italy this music box is constructed of solid burl-elm and rosewood and is finished in a light beige stain. This music box incorporates a fully functional lock and key and rustic gold hardware. The extraordinary exterior is all complimented by the wonders of sound with a precision mechanical movement, sure to bring moments of tranquility time and time again. With over 380+ tunes available, you're sure to find that perfect melody. Please see "item options" for available tunes or visit our "listening station" for all song titles as well as sample clips.